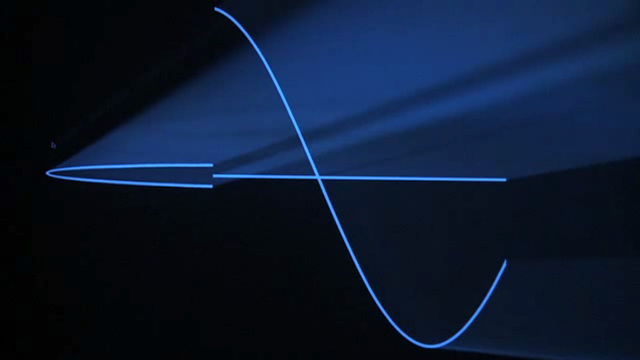 Anthony McCall became known at the beginning of the 1970s for his unique light installations, the so-called solid light films. Hamburger Bahnhof is presenting the largest exhibition of his work to date. A selection of his works from the past ten years will be shown in the historic central hall of the museum. 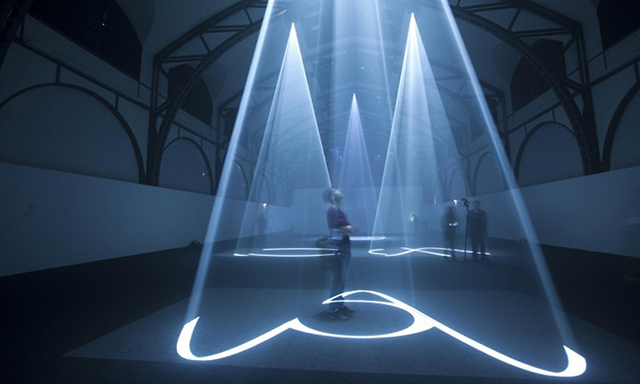 The spacious former railway station with its numerous windows will be transformed for the duration of the exhibition into a cinema space (black box), filled only with haze and veils of light. 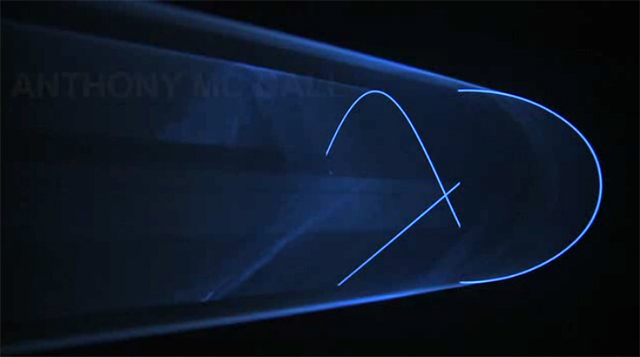 McCall has developed a signature technique for his work: animated lines, drawn in white on black, are projected into a room filled with fine haze (originally smoke and dust) so that the two-dimensional drawings are articulated as seemingly tangible, sculptural forms in real space. 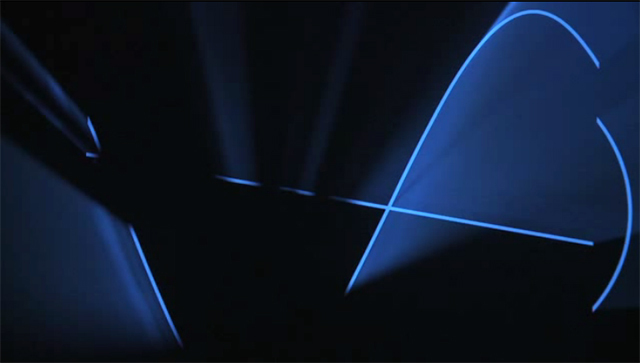 The artist began this series with the influential film ‘Line Describing a Cone’ and then continued to develop the concept in installations like ‘Long Film for Four Projectors’ (1974). Originally inspired by the filmic avant-garde, from the very beginning the artist turned cinema on its head, slowed it down, and created a fully traversable, populist space. Thus, his works exist at the borders of cinema, sculpture and drawing. The works are ephemeral, yet they seem tangible and physical. 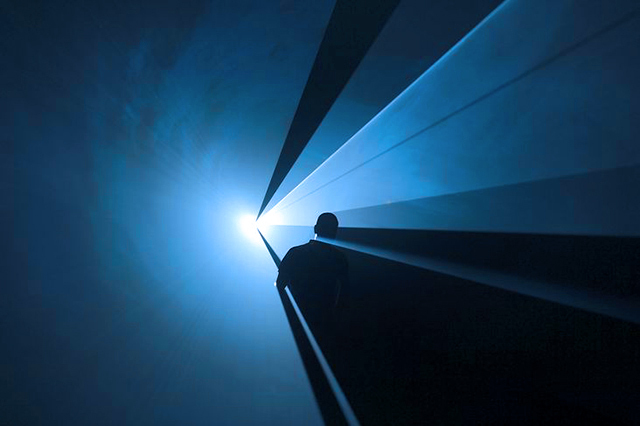 Projected horizontally through the space onto the wall, or – as in his most recent works – from the ceiling to the floor, they engulf the viewer in singular, slow-moving cones of light. Made in collaboration by Annica Cuppetelli and Cristobal Mendoza. One Hundred and Eight is an interactive wall-mounted Installation mainly made out of ordinary garbage bags. Controlled by a microcontroller each of them is selectively inflated and deflated in turn by two cooling fans. Although each plastic bag is mounted stationary the sequences of inflation and deflation create the impression of lively and moving creatures which waft slowly around like a shoal. But as soon a viewer comes close it instantly reacts by drawing back and tentatively following the movements of the observer. 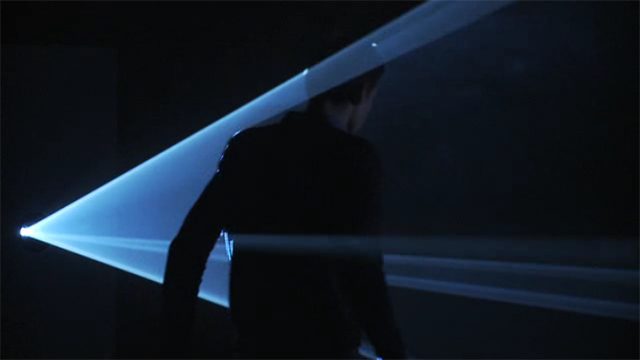 As long as he remains in a certain area in front of the installation it dynamically reacts to the viewers motion. As soon it does no longer detect someone close it reorganizes itself after a while and gently restarts wobbling around. Smartphone apps? Nice! But how about a turntable app? vinyl+ tries to expand timecode vinyl, usually used for digital djing, with visual and interactive elements. This is accomplished by sending the turntables rotational speed and needle position to a processing sketch.This sketch then generates corresponding visual output on the surface of the vinyl itself. Various scenarios for this kind of setup have been developed. The goal is to merge them into one beautiful strange interactive record. 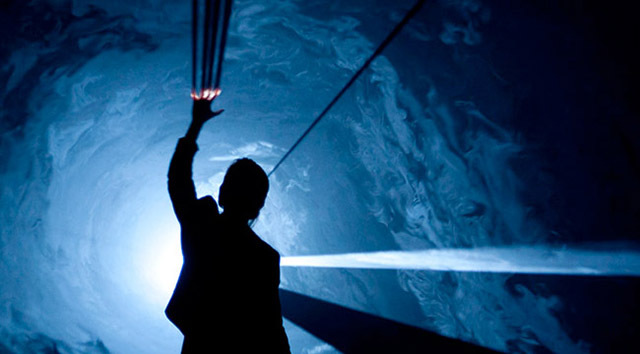 Designed for the Red Bull Music Academy 08, Guten Touch is an interactive art installation that involves people into a natural relationship with technology. A two projected displays system plus a 3m x 2m multitouch wall showcase applications designed to engage us into human friendly experiences rather than flashy and jaw-dropping visualizations. Space Invaders hit by foam balls, pixel paintings created with brushes, and digital objects held by hands try to blur boundaries between real and digital. Guten Touch is our enthusiastic good morning to natural interaction.